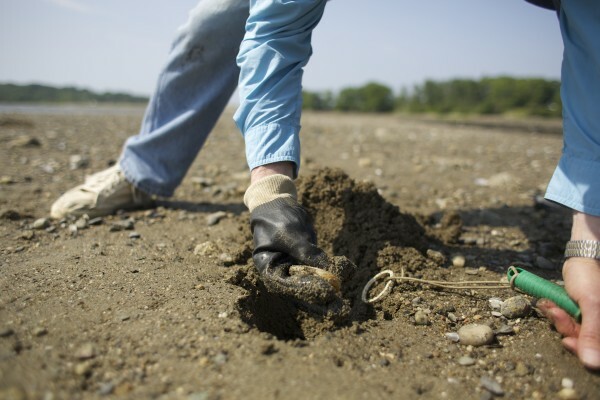 Bob Ramsdell, chairman of the Searsport Shellfish Management Committee, digs up a clam in this July 2014 file photo. BOOTHBAY HARBOR, Maine — Maine has shut down shellfish harvesting in some parts of the state and issued a recall after finding elevated levels of toxins. The closure was issued on Sept. 30, after state officials discovered elevated levels of domoic acid, a biotoxin that causes amnesic shellfish poisoning, according to Jeff Nichols, spokesman for the Maine Department of Marine Resources. The state also initiated a dealer recall on mussels and mahogany quahogs that were harvested or wet-stored last week in the Jonesport area, and clams harvested from Cranberry Point in Corea to Cow Point in Roque Bluffs. It’s the first time the state has issued a recall or closure because of this particular biotoxin, which occurs naturally in the wild. High levels of the acid can cause amnesic shellfish poisoning, which in humans can cause gastrointestinal distress and neurological problems, according to the Centers for Disease Control. The state regularly tests shellfish harvest areas along the coast for naturally occurring toxins also known as “red tide” that can cause ASP or paralytic shellfish poisoning from wild-grown bivalve shellfish species such as mussels, clams, oysters, quahogs, snails and whelks. Poisoning from red tide outbreaks are considered rare in Maine, where the most recent widely-publicized case occurred in 2007. Nichols said there’s no indication at this point of why the domoic acid levels have risen, or when the state might be able to lift the restrictions. “We’ll continue to monitor and will make adjustments to the closure as necessary,” he said.